Bentinck Memorial: Erected to the memory of Lord George Bentinck, brother of the Fifth Duke of Portland. 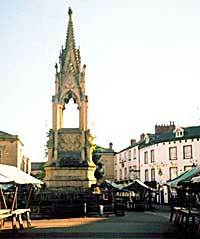 Stands in the middle of the Market Place (photo: Denis Hill). Mansfield is an ancient Nottinghamshire market town, which, by mid-Victorian times, became the county’s second largest township. Archaeological finds indicate that settlements have been here since Neolithic times, while numerous finds, including the remains of a villa, show that there was a Roman settlement in the area. Several local names indicate both Danish and Saxon influence. Although the town lies on the western edge of Sherwood Forest it is located at about the halfway point of its north-south boundaries and occupies a similar prominence within the county, leaving the town in a strong strategic position. Consequently a network of roads evolved that radiated from the town offering direct routes to Nottingham, Worksop, Chesterfield and Newark; with the latter route providing easy access to the Great North Road. The town also lay on the eastern side of the king’s highway that joined Nottingham and Bolsover Castles. A further network of minor roads emanated from the major routes, which consequently gave easy access for countless villages and small towns to Mansfield. Having become the hub of a network of roads the town obtained a market charter in 1227 and still holds regular weekly markets. Being a trading centre for a much wider community it was able to expand its industry base during the medieval period into textiles, milling, quarrying and founding amongst other necessary support industries. With Mansfield being relatively central to Sherwood Forest it became a medieval lodging place for royalty. As early as 1130 a Pipe Roll indicates that the King had a Chamber at Mansfield. Both King John and Edward II stayed at their palace in Kings Clipstone, on the outskirts of Mansfield. Above the town, on Berry Hill, is a site known as ‘King’s Stand’, indicating a location from which royal parties would watch a hunt. The medieval manor of Mansfield extended much further than the parochial boundaries to become one of the largest crown manors within the country, swallowing up many north Notts villages. However, there was little concentration of dwellings, within the manor, prior to the establishment of Mansfield market. From this early medieval base local industry became more established, with a mix of agriculture, manufacturing and commerce. Locally grown hops along with nearby coal enabled a large and thriving malt industry to develop along with the establishment of water powered corn mills to compliment numerous windmills. The leather and wool industry flourished thanks to the rich grazing grounds to be found in and around Sherwood Forest, whilst commerce also went from strength to strength, revolving around the market. By the eighteenth century the Framework Knitting industry arrived in Mansfield. This arrival not only introduced a new occupation amongst an already established industry, supplying work for hundreds of people, but it also enabled the growth of a mechanised Spinning and Doubling industry, in support of the knitters. Ten new mills were built along both the river Maun and the Lady Brook and by the nineteenth century even the old water powered corn mills were converted to the textile trade. 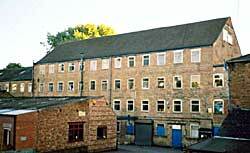 These mills not only supplied the local industry but enabled local manufacturers to become exporters. By 1824 the majority of this expanding town’s 8,300 residents lived within a 300metre radius of the market place, thus making the town a tightly packed community with substantial expanses of open spaces surrounding it. This concentrated area of Mansfield consisted of over 60 yards and courts most of which were overcrowded and falling into disrepair. The year 1823 saw the establishment of an Improvement Commission. This Commission started with great gusto to revive the heart of the town by pulling down dilapidated buildings to create a new market place, relieve congestion, clear slums and build a town hall. New houses on the outskirts of the town were constructed and various building regulations were imposed throughout the whole town. However this only became a temporary fix to a wider spread problem. Unfortunately after this initial outburst the Commission relaxed its pace and as a result of the town experiencing a population expansion, greater than the national average, the many remaining yards and alleys became more overcrowded and dilapidated, resulting in a lower mortality rate. During the era of canal building much thought was given to the isolation of Mansfield from this network. After years of deliberation it was decided that it would be more economical to construct a tramline from the Pinxton canal wharf, into Mansfield town centre rather than constructing a canal. Consequently in 1819 Mansfield had been connected to the canal network by a tramline upon which trucks were drawn by horses. Although this small tramline never exported as much as it imported into the town (in terms of weight) it greatly aided the export of both malt and stone hence bolstering their industry. It also proved to be an enormous asset to the local industry in that it increased the supply of both coal and iron, therefore enabling rapid expansion. Neither did it take long to realise the potential of this rail link for passenger transport, primarily to carry people to the Mansfield market each Thursday. Initially benches were placed in the empty trucks, on market days, and picked up passengers along its way from Pinxton to Mansfield. By 1832 special horse drawn carriages were introduced onto the rail. Consequently not only did the Rail Company and passengers benefit but the market traders increased business. Whilst the mills retained their economic strength throughout the Victorian era, despite a turbulent economy, the remainder of Mansfield’s industry saw vast changes. After several centuries the malting industry diminished to just one malt kiln by the end of the 1900s but had become complimented by a major brewer in 1855. Framework Knitting was hit by a series of depressions and consequently totally disappeared and was replaced by factory production of garments. Founding and precision engineering rose to prominence within the town, powered by coal and iron from nearby mines. Moulding sand was excavated locally and proved to be of such good quality that it became an export industry. Towards the end of this era coal mining also became prominent within the area, with Mansfield becoming the local focal point for the industry. This latter industry enabled further expansion of engineering business, all of which enabled the population to grow at a phenomenal rate. The quarrying of limestone was a strong, although small, business primarily located on the west side of the town, along Chesterfield Road with some works in Rock Valley and along what is now known as Quarry Lane. The tramline enabled the town to export stone as far a-field as London where it was used in the lower levels of the Houses of Parliament and Trafalgar Square. 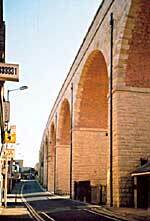 The railway viaduct, constructed in 1872, consists of 15 arches and is a distinctive feature of the townscape (photo: Denis Hill). Although Mansfield was now building upon its industrial base it still remained the strong service centre of an agricultural community stretching upwards of ten miles or more in most directions. This expanding economy enabled both the road and rail transport network to be improved. Road transport provided more services and better maintained roads, which reached out to all the major towns within the region, as well as offering services to London and other distant places. By 1848 steam locomotion had arrived in Mansfield and over the next 60 years a whole web of tracks surrounded the town, directly servicing local industry and connecting to the main lines that stretched throughout the country. The town had supported a workhouse since at least the middle of the eighteenth century. Prior to the new workhouse, on Stockwellgate, being opened in 1837, a smaller one was located on Nottingham Road, which ‘as a rule the permanent inmates numbered about twenty-four, forming a self contained community, doing their own weaving for sheets, etc., growing their own fruit and vegetables, brewing their own beer’. Religion was a prominent feature of the town with its multitude of different denominations. There were firmly established congregations of Presbyterians, Quakers (both from the 1660s), Methodists, Wesleyans, Congregational, Baptists, Methodist New Connexion and Primitive Methodists. Victorian education was offered by several private academies, Church of England elementary and grammar schools, established in 1567, a national infant’s school and Sunday schools. By 1834 the town possessed 15 schools as well as several dame schools. One of these schools being the newly formed British Infant school established in 1829, which not only attracted Mansfield children but also those from the neighbouring villages. The tired Improvement Commission was replaced by a Borough Council in 1891. They set about taking the required measures to combat these problems, such as better sanitation as well as running water into the hundreds of new homes being constructed. Map of Mansfield, c.1920 (click on the image to view a larger version of the map). By the commencement of the twentieth century the population had reached 21,000, an increase from 6,000 just a hundred years earlier. However the expansion had not diminished, for over the next 50 years the population increased to over 51,000 primarily due to the establishment of local coalmines. These mines attracted families from many different parts of the United Kingdom and in turn stimulated the construction of many new systematically built housing estates and streets. While other industries such as the Metal Box Company and the Mansfield Shoe Company also rose to national prominence. While the first 70 years of the twentieth century saw constant increase in prosperity including a steady influx of coal miners from other parts of the country, whose mines were closing, the final decades saw depression and struggles for survival. The coal industry began its decline from the early 1970s, followed by the decline of engineering and founding. Finally the textile industry virtually collapsed. Regeneration partnerships were established, who successfully managed to attract both factory and office based businesses into newly developed commercial and industrial estates. The 1980s saw the worst of the depression, with unemployment constantly the highest in the East midlands. However the turn around came during the 1990s where the prosperity of the town once again took an upward turn. This time there was no prominent trade but the town consisted of a diversity of industries including a rapidly expanding retail sector; regaining trade previously lost to neighbouring cities.